May 24. 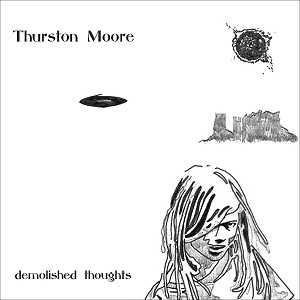 2011 | By Valerie C.
Guitar guru Thurston Moore’s all acoustic fourth solo effort, Demolished Thoughts is perfectly paired with those lazy afternoons, laying on a bed of grass, staring at the sky and just getting lost in your thoughts. Moore’s opener “Benediction” is the stand out track for me. With lush violins, folky acoustic guitar riffs and plucky harp punctuations in addition to tracks like “Illuminate” and “Circulation,” the album is full of such gems. Produced by Beck and enlisting the help of prominent artists Samara Lubelski (violin) and Mary Lattimore (harp) to add depth to each song. Demolished Thoughts, culling its name after Moore’s all-star covers band. Which, subsequently garnered its name from a lyric in The Faith’s, “It’s Time,” is sweeping and lush acoustic mastery. Now in his early fifties, Moore’s been making music for almost thirty years. Between Sonic Youth, his solo projects, and many collaborations, this record is the perfect progression for someone who’s rocked hard for more than half his life. (This progression is highly evident in his solo efforts.) And now with the golden years looming in the not-so-distant future, the angry punk energy of youth gives way to the calm peace of life’s lessons learned and the wisdom it imparts.